Photo above: Jodie after intial treatment for Non-Hodgkin's Lymphoma. She has no hair here and has white tubes into her chest (as pictured) - called a 'Hickman's Catherter'. Jodie fought the disease for a 2nd time after this and then MDS (requiring a bone marrow transplant) and currently still has a small catherter in her chest, called a 'Port-A-Cath'. Jodie's girls here were about - Julia (6) and Anna (3). Jodie is currently in remission, but has had lingering health issues due to treatment and the disease. We are hoping she will stay in remission forever. CURRENT P.E.T. (CANCER) SCAN JUNE/10. Non-Hodgkin's lymphoma is a life-threatening disease and the incidence rate is on the rise, nearly doubling since the 1970s. For young people with cancer (of all types) the stat's are equally shocking: young people with Cancer - originally diagnosed between the ages of 18 - 40 have only seen a 1% improved survival rate in the last 30 years worldwide. Compare this to paediatric and adult patients, who have seen a much higher rate in improved survival percentages. There are many reasons for this....READ ON for more of this important information. In the 2000's, the incidence of women (aged 35 - Jodie's age when she was first diagnosed) being newly diagnosed with Non-Hodgkin's Lymphoma was on average only 2 female patients per year out of all reported cancer cases in the state of Queensland (Population: 4.676 Million in 2014). From 1982-2011, the incidence of women (of all ages) being newly diagnosed with Non-Hodgkin's Lymphoma was approx. 360 female patients per year out of all reported cancer cases in the state of Queensland. The incidence of this disease is the fastest growing of all cancers, but is very rarely seen in young people, it is known as a disease of older people/the elderly. Radiation Induced Neuropathy (or delayed damage/late stage toxicity) to nerves for patients who have had 10 or more sessions of 30GY [Grey] (The emergency amount of radiation sessions/the amount of radiation given to Jodie's S1 nerve in 2006) are not even measured due to it's virtual 'non-occurance' - most radiation patients (we were told by our top Radiation Oncologist in our state) can have 60GY or more and have no delayed damage/late stage toxicity whatsoever. & RESEARCH INTO A CURE, IS THE KEY. My grandmother (now passed) prayed with me in her Sydney kitchen when I was 13 years old. 20 years later - At 33 (January/05), I faced the largest challenge of my life, but I didn't yet realise it. Here is my story: I had been getting occasional pain down my R arm and I had felt run down and tired for some time, but having a baby and a disabled daughter always seemed to account for this. (November/05) I found a large lump in my R breast. Concerned it was breast cancer, I arranged an immediate check at a specialist breast clinic. I was told it was just a reactive lymph node, due to infections and that there was 'nothing funny going on'. I had been catching more illness than ever before and it was assumed this was the reason for the enlarged nodes. In retrospect, we now know that my immune system was breaking down and I was not able to fight off infection. The enlargement of my nodes was part of the greater problem. The cycle continued in pursuit of a diagnosis: 11 months of searching; seven doctors; 21 doctors visits. I could get no assistance & no-one would listen to me. I continued working full-time, as I had no answers and people around me, started to question my symptoms. One morning - at a ladies camp, I woke to find numbness and sciatica in my right leg. Finally, after amonth of no sleep (one week of severe), terrible pain and little relief, I said to my husband, If I still feel pain in the morning, I'm going to the ER for help. An ER senior doctor decided to do a CT scan 'Just in Case'. What was revealed would shock and distress the doctors, nurses, myself and my family. I was immediately admitted, in complete shock. That night, a young doctor came to tell myself & my family what was happening & what they had found. I will never forget her words: 'I have been chosen to tell you what we have found' (in other words, she got the short straw!). 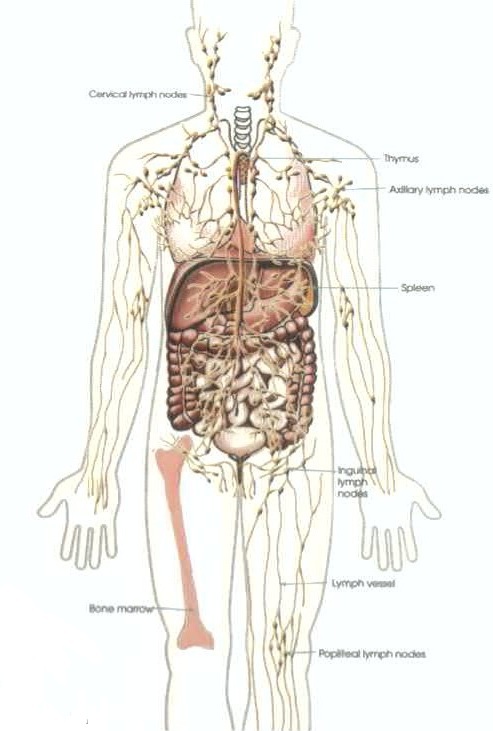 'You have a mass in your back causing your pain and sciatica; its eating into your spine and pushing into your sciatic nerve, hence your sciatica. We don't know what it is, or where its come from, but we think it's probably malignant'. I remember pleading and crying with this woman to tell the other doctors to work hard to save my life, because (at the time of diagnosis) I was only 35 and had two small children to live for. My final diagnosis was Follicular Non-Hodgkin's Lymphoma, B-Cell, low-grade, stage 4. The very last stage. I was later to find out that I had Lymphoma eating into bones, nerves and muscles in a large amount of my body. The pain in my R arm/shoulder was identified as bone pain from Lymphoma. The process of treatment then began: seven weeks of hospital as an in-patient to start with (all up 10 weeks inside during my intial treatment); biopsies, tests, MRI's, scans, x-rays and then radiation and chemotherapy. Two weeks of emergency radiotherapy to save the function of my right leg; six rounds of systemic chemotherapy and eight rounds of a special Lymphoma antibody; nine months of wearing a Hickmans catheter (for withdrawal of bloods/delivery of chemo). My hair fell out twice. I went through two stem cell harvests and much fatigue and heartache. It seems amazing (looking back), that I was able to endure the 11 previous months working, looking after the kids and home, all while my body was being ravaged by the Lymphoma and I was desperately trying to get help. Two years, post diagnosis and treatment, my former GP was disciplined by our state medical board for not performing to expected medical standards, set by our state board for all doctors. I may have been diagnoised sooner, had these standards been met. This was a long process and took me (on my own) 2 years of active discussions, investigations & consultation by the medical board, regarding my experiences and the difficulties I experienced in trying to get a diagnosis. In the last several years, I have had over 70+ treatments of chemotherapy and other drugs, been in hospital thousands of hours, had a device (port-a-cath) and Hickmans implanted in my chest and also been a blood and plasma receiver many times. Due to the extensive state of my intial disease, I have been advised that I am medically incurable. As I continue to fight and remain positive, my aim is to believe for a long and disease free life, regardless of prognosis. I went into remission in March 2007 and fell back out of remission in January 2008. My right leg function was saved again after relapse and my current status is remission. Much of my original recovery can be attributed to some big prayer and amazing hematologists at the Royal Brisbane Hospital (RBWH) and other medical teams. We havegathered opinion about my disease status and/or whether I am dealing with Progressive Radiotherapy Scaring & lesion damage. My R leg & foot have been progressively become weaker over the last year (Feb/10 - Feb/11). We now know we are dealing with progressive scaring. My faith in God and the knowledge that I am assured of residence in His heaven, has given me the strength and the motivation to continue when it all seemed too much. I cling to the promise of Jeremiah 29:11 - For I know the plans I have for you says the Lord. And the vision of the 'woman with the issue of blood'. July/2018 - Jodie's GVHD continues to be an issue and sometimes can limit her 'quality of life'. However, she stays as active as possible and rests inbetween. Recently, Jodie went through two R foot stress fractures, due to her neuropathy. 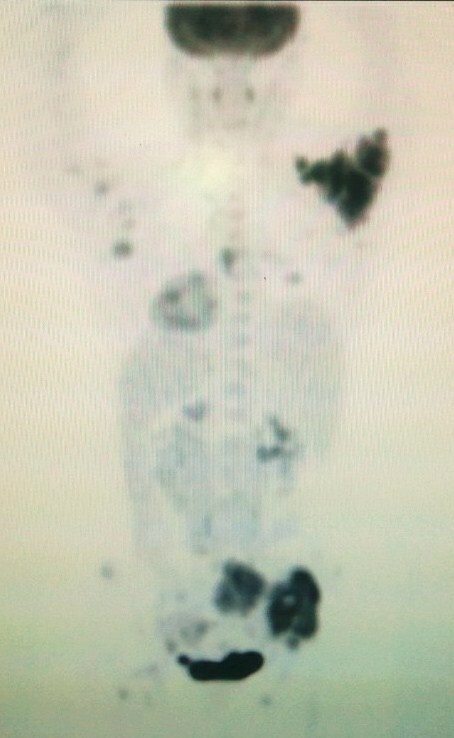 Avascular Necrosis (AVN) has also been discovered (in the early stages), due to high dose steroids, after transplant, in 2015. The AVN is currently located in the R Femur ball of the hip socket. Investigtions and discussions are ongoing and will be for the long term. A hip replacement may be required in the future. March/2017 - Jodie continues to follow the instructions of her doctors, with much medication and a monthly transfusion of h﻿uman plasma. August/2016 - Jodie continues to fight GVHD in the Lungs and Eyes. She currently takes 48 tablets a day. August 22nd/2015 - 8 months on from a Bone Marrow Transplant in late December/2014. Jodie has fought GVHD (rejection disease of Jodie's unrelated bone marrow donor - a 30 year old male from overseas) of the mouth, throat, skin, eyes and currently - the lungs. Jodie is fighting this and looking forward to full health, using medications and the advice of some of the best doctors in the world. September/2013 - Jodie continues to be 'in remission' with no disease return. Her immune system was found to be lacking or suppressed in a certain line of her Lympocyte T-cells (which protect the body from infectious bacteria, mainly located within the mucosal areas - sinus, nose, throat). Infectious diseases at Jodie's hospital re-immunised Jodie so that she does not constantly get infections (8 in 2011 and 6 in 2012). So far this year, Jodie has only had 2 infections. This has meant that she can now travel more and start looking for a minor employment role. Jodie's right leg continues to weaken and her calf muscle is constricting, a condition called Atrophy - due to Peripheral Neuropathy of her S1 nerve controlling the right leg. Essentially this is damage from radiotherapy and tumour scaring which cannot be fixed or changed. Jodie must be careful with physical activity and fall risks. The family are currently fundraising for a HYDROTHERAPY POOL/SPA to reduce pain and create more exercise opportunities for both Jodie & her daughter, Julia. February/2012 - Jodie had no in-patient admissions to hospital in 2011, wonderful!! Although, she regularly goes to hospital for out-patient appointments for her port-a-cath, bloods and Heamotology checks. She also attends various other services, including Prothetics for a new leg brace. 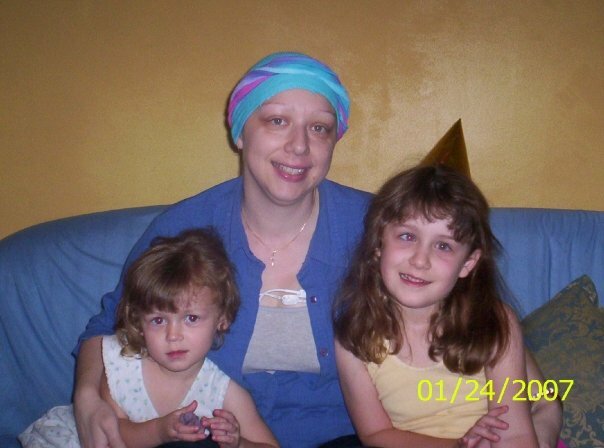 June/2011 - Jodie is believed to be in active remission. However, she continues to suffer from progressive scarring to the S1 nerve, which presents itself as weakness & muscle wastage. Jodie is also monitored for any changes in her health and assisted medically for significant pain post chemo & due to her scarring. Regardless, Jodie is a happy person. making every effort to raise awareness for others who suffer. February/2011 - Stem Cell Transplant once again halted due to Neurology opinion - NEW 2nd Neurology opinion believes the problem is PROGRESSIVE RADIOTHERAPY SCARRING & LESION DAMAGE. August - November/2010 - Stem Cell Transplant was postponed at the 11th hour, late August. We opted to wait for more evidence on the next MRI, image taken 12 November/10 (waiting on results). August/2010 - Transfer to Princess Alexandra Hospital, under a new Lymphoma team. June 04/2010 - Fall due to footpath/building & R leg weakening again (0nly 2 weeks after first CYT LP). June 11/2010 7th LP. Mid-May/2010: Started Lumber puncture chemo & Steroids to halt weakness/pain to R leg. Late February/Early March/2010 = 2 falls at home, indicated the beginning of pain in the S1/Sacrum & progressive R leg weakness. Admitted to hospital Late April/2010. Marrow testing returns a 'No Lymphoma or MDS (Myelodysplasia)' found in the sample. But - poor recovery (post chemo) of Granulopoiesis Cells (mainly Neutrophils), due to suspect bulk toxicities. This means some parts of my White Blood Cells have not recovered well post Chemotherapy. December 09/Blood counts not recovering. 3rd NHL relapse suspected, marrow testing commenced. July 09/Blood counts should have recovered. April 09/Finished 2nd course of systemic chemotherapy, status: STABLE. January 09/Commenced 2nd course of systemic chemotherapy. December 08/Relapse -lesion now visable on S1 (Sciatic Nerve), through MRI. August 08/2nd Relapse of NHL confirmed, start immediate Mabthera therapy & injection chemotherapy into the spine. Become medically retired, leave work immediately. June 08/R Leg starts to weaken. January 08/R Foot numband toes - no movement. March 07/Finish 1st course of systemic chemotherapy, status: REMISSION. September 06/Original NHL Diagnosis through ER:leave work immediately. November 05/Noticable symptoms start to occur, 11 month search commences for medical assistance, medical negligence occurs and Jodie's diagnosis is delayed. GY = Grey (Measured/metered radiation). CVP = C: Cytoxan - V: Vincristine - P: Prednisone. CHOP = C: Cyclophosphamide - H: Doxorubicin - O: Vincristine - P: Prednisone. F = Fludarabine. CYT = Cytarabine. INN = Azacitidine. INITIAL DISEASE DISCOVERED/DIAGNOSIS - LATE SEPTEMBER/2006. 2 x CVP (6 treatment dosages chemo & related). 2 x R (2 treatment dosages B-cell monoclonal antibody). 4 x CHOP (16 treatment dosages chemo & related). 4 x R (4 treatment dosages B-cell monoclonal antibody). 1 x C massive dosage (1 Prep/Stem Cell Harvest). 6 x R (6 maintenance dosages B-cell monoclonal antibody). RELAPSE - DISEASE S1 (SCIATIC NERVE) IDENTIFIED - AUGUST/2008. 5 x R (5 treatment dosages B-cell monoclonal antibody). 5 x MTX (5 Lumbar Puncture treatment chemo & related). 3 x F (3 treatment chemo & related). DISEASE REDUCED IN S1 (SCIATIC NERVE) STATUS: STABLE - JUNE/2009. Suspected RELAPSE - DISEASE S1 (SCIATIC NERVE) IDENTIFIED - MAY/2010. 1 x CYT (1 Lumbar Puncture treatment chemo & related). 1 x MTX (1 Lumbar Puncture treatment chemo & related). (Suspected relapse turned out to be progressive scarring to the S1 due to post radiotherapy/disease). 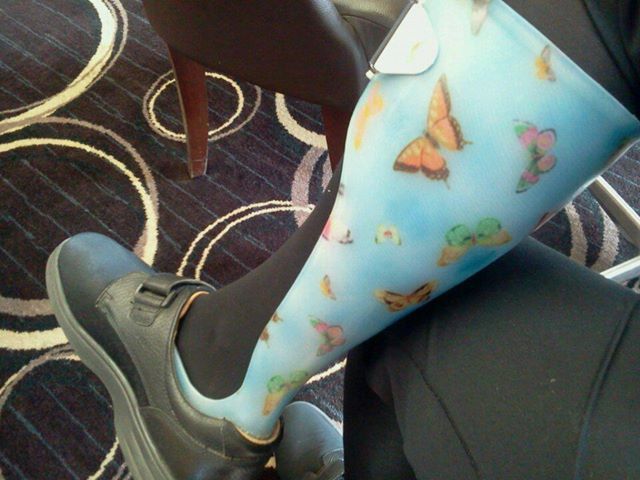 however she uses a cane and a Leaf-Spring ATO splint for foot & leg support. 14 x INN (Azacitidine/Vidaza - Subcutaneous Injections)﻿.﻿﻿ Myelodysplasia Treatment: (August 2014, 7 days﻿). Searching for a Stem Cell Donor, in Australia & beyond. 7 x FLU/MEL VUD ALLOGENEIC BONE MARROW TRANSPLANT. JODIE'S BONE MARROW TRANSPLANT TOOK PLACE ON Friday, 19th December/2014. (28th January/15 - blind in both eyes for 2 weeks), 6 months post BMT: lung GVHD. 10 x ATGAM - light chemotherapy (lymphocyte immune globulin)﻿, derived with 50 mg of horse gamma globulin. post BMT - the infection that first started Jodie's NHL in 2006. 30/03/15 - OUT OF THE DANGER ZONE - REACHED DAY100, POST BMT. (break in tibula & fibula) in both L & R feet. Total: 94 dosages of treatment. and many, many infusions of human plasma, immunoglobulin (IVIG). Jodie's Journey is a non-profit organisation. All rights reserved.